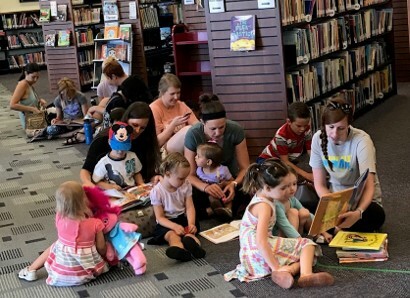 Prop D asks citizens to vote for or against the issuance of $62 million in bonds for improving, expanding, and equipping a Library in a building owned by the City. The City owns the former Beal Aerospace factory which it proposes to convert into the new library. When completed the new library would be 146,000 square feet, providing enough space to serve Frisco’s growing population. The new library’s capacity would support population growth to 267,000 residents. How would property taxes be affected? Based on a home with an assessed valuation of $400,000, the city tax difference is estimated to be $16 by the 5th year of the plan. Additional tax information begins on slide 20. 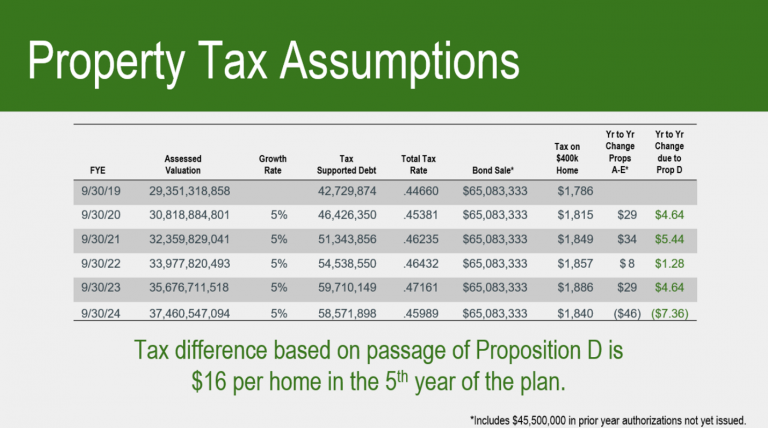 How is Prop D cost effective for Frisco taxpayers? 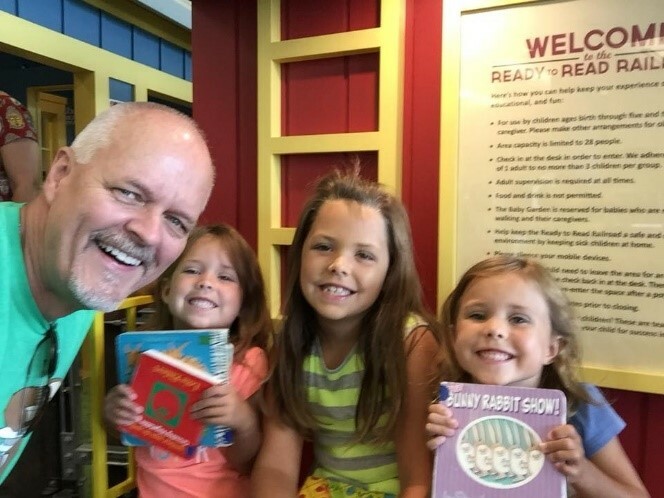 A single full-service library location is more cost effective to operate than building, stocking, staffing, and operating multiple branch libraries. Renovating and converting an existing City owned factory building saves the cost of land and new construction. The former Beal Aerospace factory provides needed space now and offers the option of to expand to the size needed when the City reaches its planned build out population. To expand the library in its existing location at City Hall would result in less space and a higher cost. More details available. Moving the Library from City Hall avoids costly a City Hall parking garage expansion. More details available. 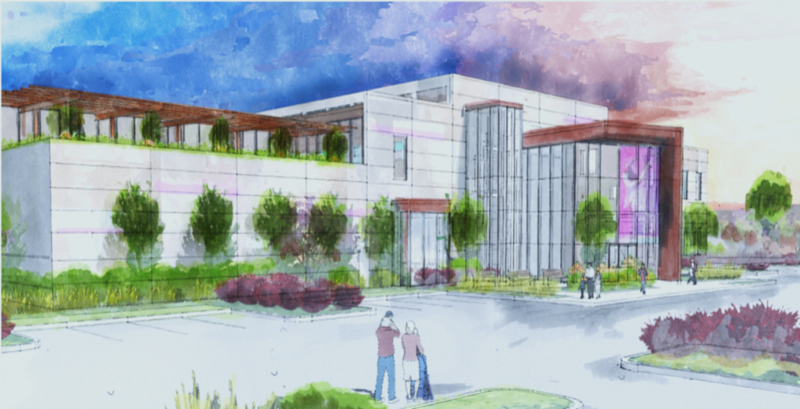 These preliminary concept images illustrate the variety of services possible through converting the Beal Aerospace factory into a centrally located 146,000 square foot public library. Indoor and outdoor special event spaces for community gatherings and private groups. More books with greater variety. Innovation Labs featuring high tech equipment to empower entrepreneurs, encourage experimentation, and provide job training. Creativity Classroom designed for project style programs, events, meet-up activities, private parties, crafting events, etc. Open areas for adults with comfortable seating, browsing, computers, and wi-fi. Improved & expanded Children’s services including areas for homework and quiet reading to support student success, the popular Ready to Read Railroad to prepare preschoolers for kindergarten, hands-on student learning and discovery areas, space for expanded children’s programs and more children’s books. Teen area focused on services and collections for residents ages 13 to 17. Quiet area for those who want uninterrupted reading, study, and learning. Conference and study rooms for groups and individuals. Terrace for public use and special events. 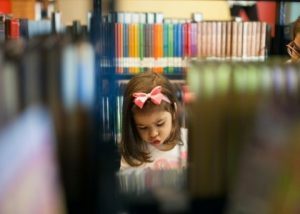 Prop D’s passage provides Frisco residents with a public library sized to Frisco’s growing population and access to the library services most valued by our community. Why do we need a larger Library? 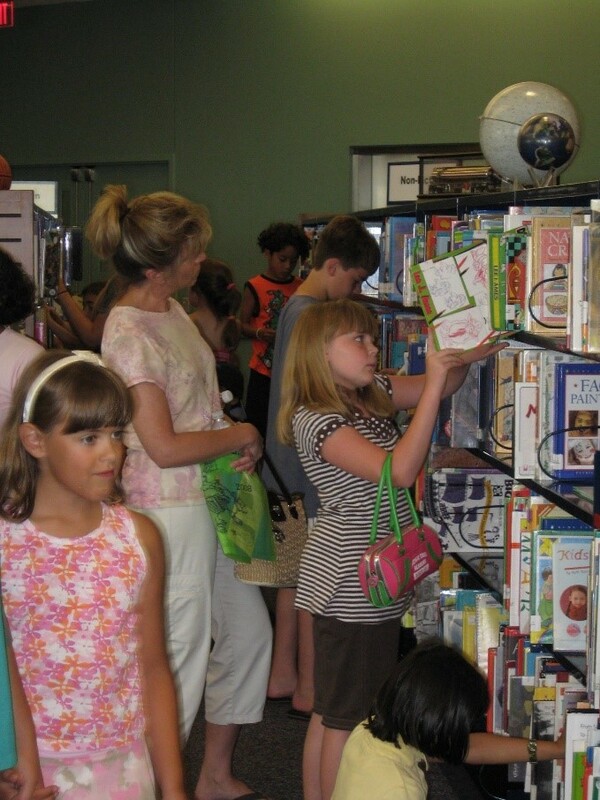 Crowded asiles while children select books in the youth area. Reading on the floor, lack of space for seating. 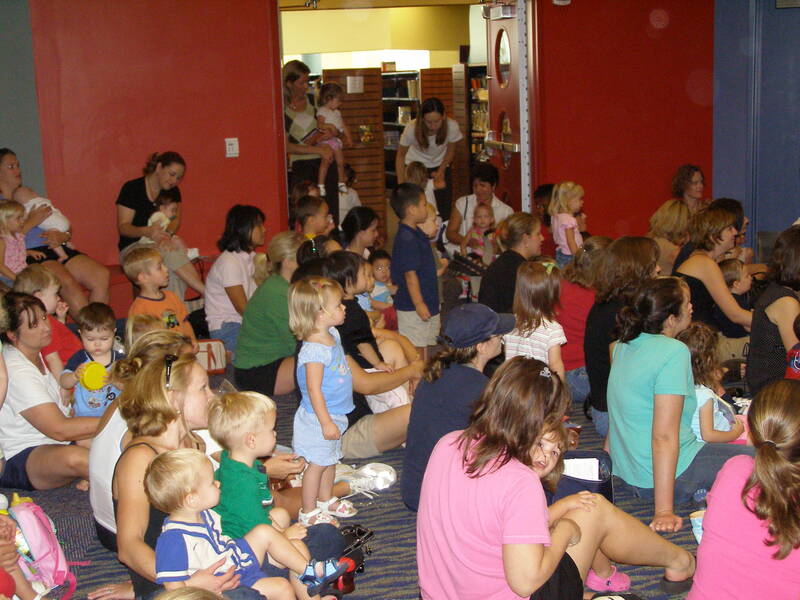 Overflow during Toddler Story Time. Frisco has outgrown the current Library. Frisco’s library was built to serve 91,000, the current population is 183,000+. In the last 5-years, use of the Library has grown faster than the City. Frisco grew 31% and Library use grew 46%. 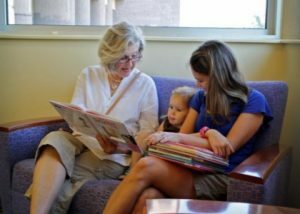 Frisco residents use library services more than their neighbors. 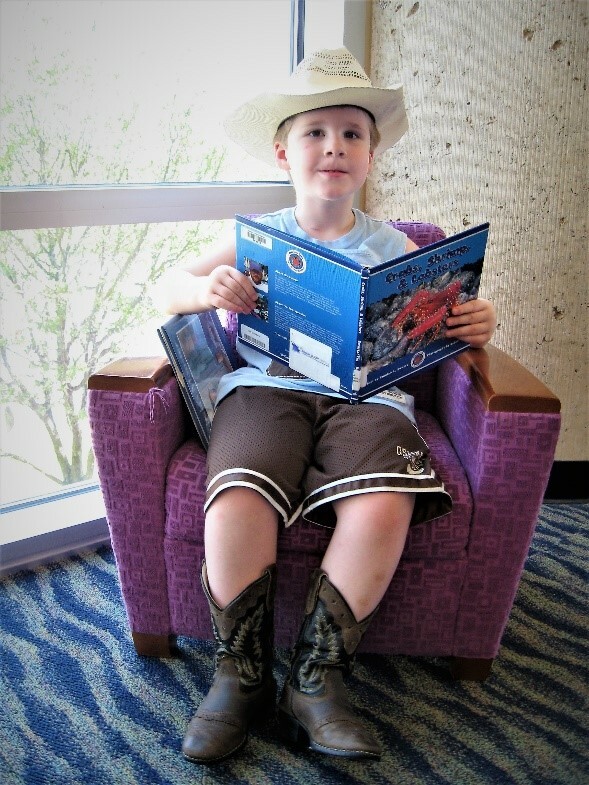 Frisco residents use library services 6% more than residents of other North Texas cities. 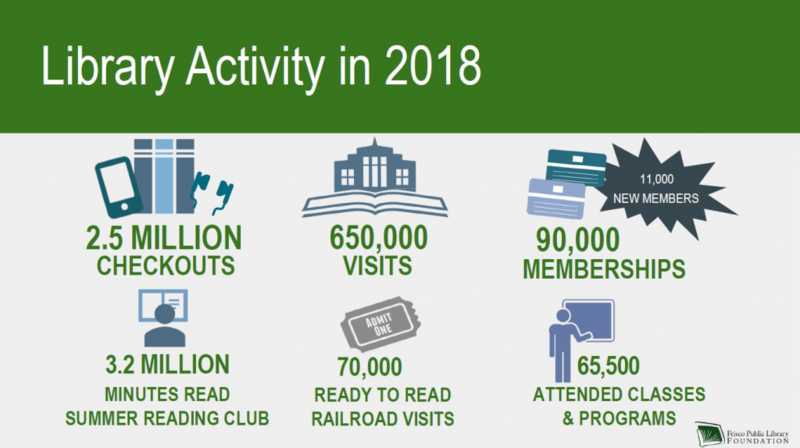 Library use continues to increase. How much library space is needed? The Library’s Master Plan recommends .55 square feet per Frisco resident. The current library in City Hall is half the size needed for today’s population. Proposition D would build a 146,000 sq. ft. library. This would meet the needs of the City to a population of 267,000. The chart below shows library space needs through the City’s build-out. Current Library Size 50,000 sq. ft. The options included expanding the existing library, building a new library, and renovating an existing city owned building (the former Beal Aerospace Factory). Converting the former Beal Aerospace Factory into a library offered the lowest price and the largest number of square feet. Essentially MORE LIBRARY for LESS MONEY. See the chart below. Why isn’t the library at city hall being expanded? Cost and size, recent estimates for expanding the library at city hall were $85.7 million for 118,000 square feet. Due to constraints with the City Hall building and lot, the library could not exceed 118,000 sq. ft. At that size, the building would be too small within 2-years of completion, making expanding the library at City Hall an expensive short-term solution. What happens to the 2015 bond funds to expand City Hall, Courts and the Library? The bond funds approved in 2015 were for city hall, library expansion at city hall, and municipal court. The 2015 bond money is insufficient to accommodate the original building program. $8.6 million will be used to convert the old senior center to a municipal court building. $5 million will be used to convert the area currently occupied by the library for new uses within city hall. Funds that would have been spent to expand the library in city hall will not be spent. The 2015 bond is insufficient to fund an expansion of the library. See here for cost details. Funding from the 2015 bond was $37 million to expand the library, add a court building, and expand city hall offices. The current estimate to expand only the library at city hall is $85.7 million, this amount is $23 million more than the funding requested in Proposition D.
What if Proposition D does not pass? 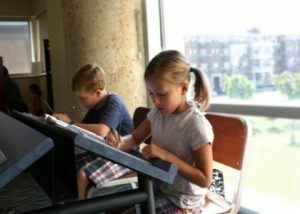 Funding from the 2015 bond is insufficient to fund the previously planned expansion of the library at city hall. Library collections will not have space to match the growth of the population. Library will lose accreditation when collections fall below required levels. Without accreditation the library cannot participate in interlibrary loan, TexShare digital resources program, or receive state and federal grants. In 2018, these services saved Frisco taxpayers $660,000. Access to seating and tables diminishes. Currently, during busy periods library users resort to the floor to read and study. This problem will increase. Programs and events become more crowded due to limited space and a single program room.